Campaign for passing of Ordinance to construct Ram Mandir; Naamdindi (chanting procession), collective chanting programs, representations, demonstrations, posters, signature drives as part of campaign undertaken by thousands of Shriram devotees ! It is a historical truth that Ayodhya nagari, which is the seat of faith of millions of Hindus, is the birth-place of Prabhu Shriram. There are several proofs about it in Holy Scriptures of Hindus. Different religious places are witness to these facts. It was again proved in Court with archaeological proofs and in the year 2010, Allahabad High Court passed verdict of ‘Ram Janmabhoomi’ being the true birth-place of Shriram. Even then, the same issue is pending for past 8 years in Supreme Court. How long should Hindus wait for construction of Ram Mandir ? Hindu Janajagruti Samiti (HJS) has therefore, made an appeal to Hindus from all over India, to make special prayers for removal of all obstacles in construction of Ram Mandir. Shriram-devotees from the country responded positively to the appeal. Thousands of Shriram-devotees participated in various drives undertaken through this campaign, such as ‘Dindis’, collective chanting programs, submitting representations, staging demonstrations, displaying posters, signature-drives etc and made a forceful demand for passing of Ordinance for construction of Ram Mandir. ‘Naam-dindis’ taken out carrying picture of Shriram amidst chanting His name ! ‘Dindis’ were taken out in 5 cities viz. Kolhapur, Panavel, Nalasopara, Kalyan and Beed with picture-frame of Shriram and chanting of Shriram’s name by devout Hindus. Many participating devout Hindu activists and Shriram-devotees expressed their views while concluding these ‘dindis’ which were taken through different routes. Awareness was created through such ‘dindis’. Saints also blessed the ‘dindis’ with their presence at many places. By chanting Shriram’s name, not only people were motivated to chant but it also created ‘sattvik’ atmosphere. These ‘dindis’ with hundreds of people joining and chanting God’s name were looking like ‘Warkaris’ going for ‘darshan’ of Vitthal ! Success possible only with God’s grace ! Therefore, for construction of Ram Mandir also, there has to be spiritual support ! Taking into account the importance of such support, HJS made an appeal for holding programs of collective chanting of Shriram’s name. An example of Swa. Savarkar is quite apt here and that is, Swa. Savarkar had said, “Every Hindu sitting at home and praying for freedom of Hindustan is equally important as those who are actually taking part in the freedom-movement.” Prayers to Shriram were also held at various places, following this advice for removal of obstacles in construction of Shriram Mandir; for the Government getting strength to pass an Ordinance for construction and for concerned Judges in Court to be able to take quick decisions. Chanting of Shriram’s name held at ‘Kumbh-nagari’ Prayagraj ! HJS held programs of collective chanting at the famous ‘Sankatmochan Shri Hanuman Mandir’ at Kumbhnagari Prayagraj in the presence of Saints-Seers and devout Hindu activists, for construction of big Ram Mandir in Ayodhya. Shri. Vishwanath Kulkarni, Coordinator of HJS for UP and Bihar States said on the occasion, “Let us join these chanting programs in large number and provide spiritual strength for construction of Ram Mandir.” ‘Jyotish and Acharya Shivadatta Pande, Shri. Chetan Rajhans, national spokesperson of Sanatan Sanstha; Shri. Shivashankar Pande, the priest of ‘Sankatmochan Hanuman Mandir’; Shri. Anand Jakhotia, State Coordinator of HJS for MP and Rajasthan States; along with members of HJS were present on the occasion. Sanatan Sanstha, which is working for protection of nation and Dharma, and HJS distributed handbills on the subject during this program. 1. Saints-Seers extended best wishes for the program. 2. Devotees, who had come to Prayag, also joined the chanting program. 3. Devotees were attracted towards the drive after listening to chanting in Saints’ voice recorded and played at the venue. 4. CM Yogi Adityanath was to attend a program near the temple to announce opening of the ancient ‘Akshay-vat’ and ‘Saraswati-kup’ for devotees and there was tight security in the area; still the program by HJS was held without any obstacles. Special highlights and spiritual experiences during drives undertaken in Maharashtra ! A.Women had tears of ‘bhav’ while chanting in Gopalkrushna Mandir. B. Everyone from Lokmanya society decided to continue chanting and prayers till Ram Mandir was constructed. 2. Shri. Shiva Shinde, the founder of ‘Sinh Sena’ held chanting session at his office in Vita. 3. It was decided by devout Hindus from Kaulage to recite ‘aarti’ at Hanuman Mandir for 15 minutes every day. 2. Many devout Hindus felt that the idol of Shriram in a temple at Akluj where they were chanting, was smiling at them. Sou. Khade could smell fragrance and felt that Deities had come there. 3. Smt. 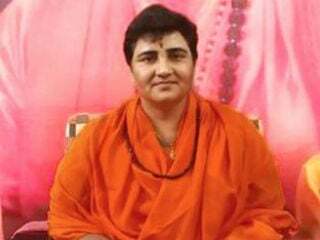 Pavase, a reader of ‘weekly Sanatan Prabhat’ from Akluj was told about the drive for Ram Mandir; then she gathered all women from her ‘Bhajani Mandal’ and did chanting of Shriram’s name. Everyone was experiencing different kind of enthusiasm and joy at that time. 4. Hearing male voice while chanting and seeing Gondavalekar Maharaj chanting there: Three women heard a male voice when they were chanting in a temple at Akluj (Dist. Solapur) when there was no man in that temple. Sou. Khamane could see that none other than Gondavalekar Maharaj was sitting there and chanting loudly. 5. After chanting session held in a temple at Akluj, women asked for how much time should they chant for construction of Ram Mandir. One woman said that she would chant every day for Ram Mandir. 6. Shri. Suresh Joshi, a reader of ‘Dainik Sanatan Prabhat’ from Mangalvedhe took initiative in submitting representation to Tehasildar. 7. A 7-month old baby-girl clapping during chanting : A 7-month old Kum. Ishwari Galande sat quietly throughout the collective chanting program held at Ram Mandir in Barshi. She was clapping in between and was bowing before God. 8. All women confident of favourable verdict about Ram Mandir : Women from ‘Geeta Bhajani Mandal’ were explained about Ram Mandir drive at Datta Mandir, Jagadamba Chowk, Solapur; so they immediately performed ‘puja’ of Shriram and started chanting. They showed interest in HJS’ conducting ‘Dharmashikshan’ classes. She also said that all of them enjoyed and were very happy to chant. All women said that decision on Shriram Mandir would be passed in favour of construction of Ram Mandir. 9. One woman felt during collective chanting that Shriram was standing there with bow and arrow. 10. Devout Hindus made a resolve to join ‘Dharmakarya’, after attending ‘Hindu Rashtra-jagruti Sabha’ held at Latur recently. Many of those devout Hindus were there for submitting representation to District Collector related to construction of Ram Mandir. Devout Hindu activists chant Shriram’s name at Malad (Mumbai), for construction of Ram Mandir ! 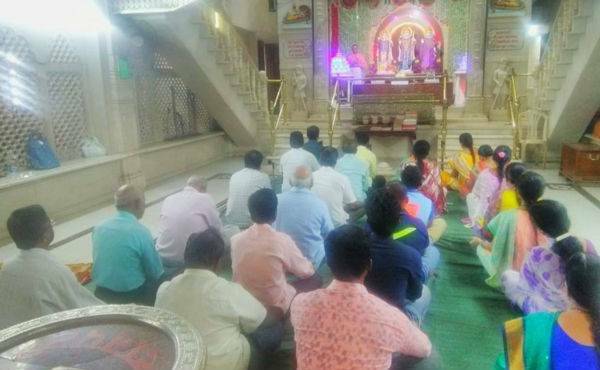 Malad : Collective chanting was held at Shriram Mandir in Somwar bazaar after making prayers to Shriram. Signature-drive was undertaken for the demand of passing an Act in the Parliament, for construction of Ram Mandir. Shri. Thakarashi, a devout Hindu said that all Hindus should come together for Ram Mandir. Hindus are trying for construction of Ram Mandir for the past 70 years through various fronts, including legal solution. HJS and Sanatan taking initiative in this fight for spiritual strength is quite nice gesture. 1. Many citizens were spontaneously performing ‘puja’ on the route of ‘Dindi’. Few flower-vendors offered flowers on the roads. Many people were paying obeisance to ‘Dindi’ and picture-frame of Shriram heading the ‘Dindis’. 2. Many local police felt good after listening to ‘aarti’ on that day. Demonstrations were staged under aegis of RHA at many places. The main demand was for construction of Ram Mandir by the Government by passing necessary Act. Representations kept at the venue of demonstrations were signed by hundreds of Hindus. Later, these representations were submitted to the local Government administration offices. The idol of Shriram has been presently kept in a tent at ‘Ram Janmabhoomi’ which is in a way, denigration of the Deity. Devotees are not allowed to perform ‘puja’ at this place. In a country where Hindus are in majority, it is most shameful that their right of performing ‘puja’ has been denied. BJP is ruling at the Centre as well as in UP State with absolute majority; therefore, law should be immediately passed in Parliament for construction of huge Ram Mandir in Ayodhya, was the demand made at many places during demonstrations. Confidence has been created towards Sanatan Sanstha and HJS for building of Ram Mandir ! At many places all over the country, collective chanting and prayers were held. Devout Hindus attending ‘Dharmashikshan’ classes participated in the programs at many places. Temples’ Chairmen, Trustees of temples joined the chanting sessions at many temples. The Government, which has won power by promising to construct Ram Mandir, is not doing anything; therefore, people at many places felt that Sanatan Sanstha and HJS would be able to do something in this context.